Now is the time to join the race to secure a seat at the Caribbean Poker Classic which takes place in St Kitts at the end of November. At Sun Poker, starting this week (1st May) and running until October, Sun is hosting its great value $30,000 MPP Leaderboard. There are three $10,000 tournaments to qualify for and the top two in each receive their tickets to the Caribbean with the next four receiving cash prizes of $500. In all, six lucky players will secure packages to this Caribbean poker spectacular at St Kitts through the Sun Poker MPP Leaderboard. The recent EPT winner in Poland, Peter Jepsen, will testify to the excitement of the Caribbean Poker Classic. Last December, he took away $165,000 playing the main event and enjoyed several days in the sun-soaked paradise that is St Kitts. MPP's are "My Player Points" and you accrue them as you play at the Sun Poker tables. Sun is powered by the leading software platform provider, CryptoLogic Inc so you will always have plenty of choice of table stakes and games. To qualify for the chance of a fabulous Caribbean poker trip, you simply have to become one of the top 250 MPP earners in any calendar month between May and October. Through this you gain entry into one or more of the $10,000 CPC and cash freerolls. The top 25 MPP earners in each month can play in all three freerolls giving you three opportunities to qualify. The top 100 MPP earners can enter two of the events, while the top 250 are guaranteed a place in one of them. Clearly, it will pay to try to make the highest bracket as the freeroll reserved for the top 25 will have a smaller number of players. "My Tournament Points" Leaderboard with a further two $10,000 CPC Freerolls up for grabs to those who finish in the top 250. The top 100 get to play both, while the top 250 get to play one of them. This fantastic Caribbean race has just started. Make sure you join the race now and run it for the next five months. St Kitts in the sun awaits. 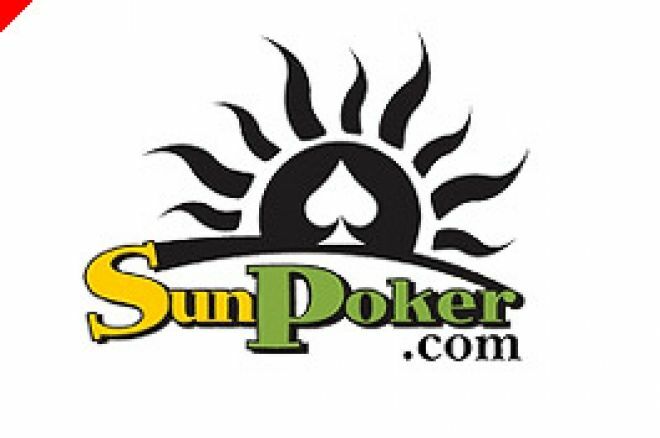 Don't forget, if you are new to Sun Poker in May, you will gain access to an exclusive New Player $10,000 cash freeroll. That is some welcome gift as is the $100 reload bonus available to you every month at Sun Poker (click that link for more information).